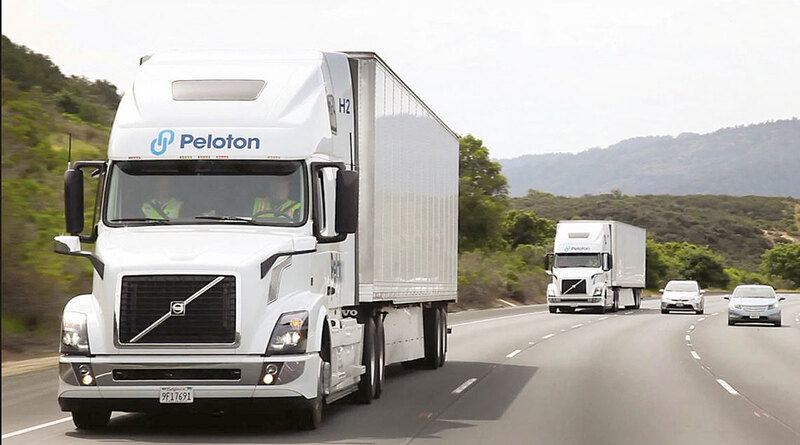 Peloton Technology recently demonstrated its driver-assist truck platooning system on Interstate 96 in Michigan with two Volvo VNL 670 trucks, featuring one following about 60 feet behind the lead truck. The demonstration was conducted on Dec. 1 in the Novi area with the state police, the Michigan Department of Transportation, and the state’s economic development agency. Peloton announced it plans to deploy the system commercially in 2018. A 2016 Michigan law allowed two electronically-coordinated commercial trucks to platoon on its roads closer than the state-mandated 500-foot minimum as long as the operators submitted plans to the Michigan Department of Transportation and Michigan State Police. Peloton’s program includes a wireless vehicle-to-vehicle communications link between two trucks that allows them to form a platooning system where one follows the other at a close distance to create a fuel-saving aerodynamic draft. The system offers in-cab audio and video display for both drivers. At a 40- to 50-foot following distance the system can reduce fuel use by 4% for the lead truck and 10% for the following truck, for a combined 7% reduction, according to the North American Council for Freight Efficiency. The council notes that savings could be 4% under real world conditions. The National Renewable Energy Laboratory has pegged team fuels savings at 6.4%. Mountain View, Calif.-based Peloton operates a cloud-based Network Operations Center that can pair up trucks and can adjust system parameters for local conditions. Peloton requires each truck be equipped with such safety features as collision avoidance, always-on radar sensors, lane departure warning and air disc brakes.